Vintage is in! 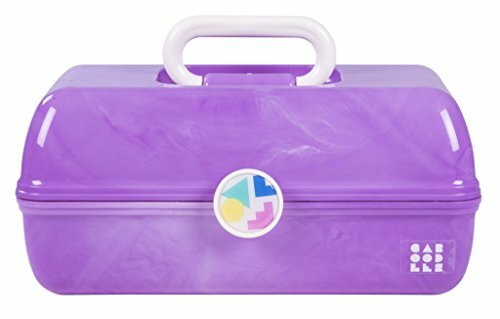 The on-the-go-girl; Caboodles cosmetics case lives up to its name, with extensive organizational travel features. The case is a durable and simple organizational tool featuring a sturdy handle and trays that raise when the case is opened. The bottom of the case creates a large space to hold larger items like brushes, while the top of the case is a tray divided into 3 compartments to store items of ranging sizes. The lid on the large raising tray props open to offer a mirror on the underside, while a removable shallow tray protects you delicate brushes from damage during travel. With plenty of room left to spare, the on-the-go-girl; case is the perfect mobile solution to maintaining your style anywhere. If you have any questions about this product by Caboodles, contact us by completing and submitting the form below. If you are looking for a specif part number, please include it with your message. 50 pack 1ml（1/4 Dram Mini Amber Glass Essential Oils Sample Bottles with Orifice Reducer and Black Caps for Essential Oils,Chemistry Lab Chemicals,Colognes & Perfumes.3 plastic droppers as gift.